Highly likely to cause drowsiness. We have an announcement: after exhaustive testing at G-labs, we have found the softest pillow ever. Now we know it looks rather ordinary, but it isn’t. DO NOT be fooled by its plain exterior. 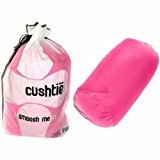 The Cushtie hides a dangerous secret within its soft outer skin… That secret is thousands of spongy polystyrene micro-granules. They make the Cushtie indescribably huggable. Indeed, once you hug it, it is almost impossible to let go. So for goodness sake be careful when you come in to contact with one.